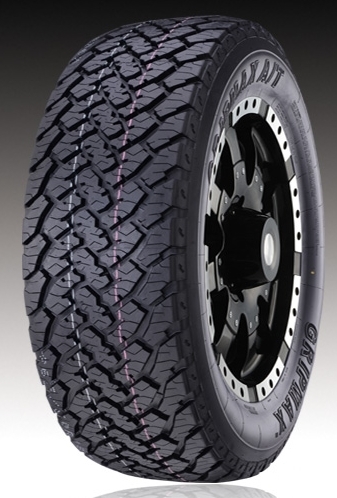 Tough all-terrain tyre designed with an aggressive, self-cleaning tread pattern that provides off-road traction, durability plus an impressive on-road performance. The Gripmax A/T is ideal for part-time 4X4 enthusiasts where who don’t want to change their tyres when having off road fun. The resistance to Impact Breacks and Bruising is superior. The aggressive all-terrain design is engineered to provide outstanding performance in both on-road and off-road driving applications. The GRIPMAX A/T tread pattern exploits a combination of features specifically suited to provide solid all-terrain performance, superior all-season traction, excellent stability, confident handling and reliable tread wear. The molds used to manufacture the GRIPMAX A/T incorporate a venting technology that eliminates micro-vents in the tread area. This ventless technology provides a crisp, clean, premium appearance. Variable Density Nylon Technology Nylon is strategically positioned and applied in a manner to resist flat spotting for improved ride quality and a balanced, even tread wear for longer tread life.